When it comes to romantic comedies, there’s only so much conflict an audience can be expected to endure before any hope for a believable happy ending goes sailing out the window. It’s a tricky, indefinable line in the sand – structurally, the genre depends on conflict to fuel a big, sappy, crowd-pleasing third-act reunion – that, more often than not, determines whether a picture sinks or swims. We can buy that Steve Carell and Catherine Keener will work out their differences and forge a lasting bond in The 40-Year-Old Virgin, or that Billy Crystal and Meg Ryan can exorcise their neuroticisms together in When Harry Met Sally. But when an on-screen union breaks down into total toxic dysfunction (see: the entire cast of Couples Retreat), it’s hard to resist thinking the stars would be wise to see other people. 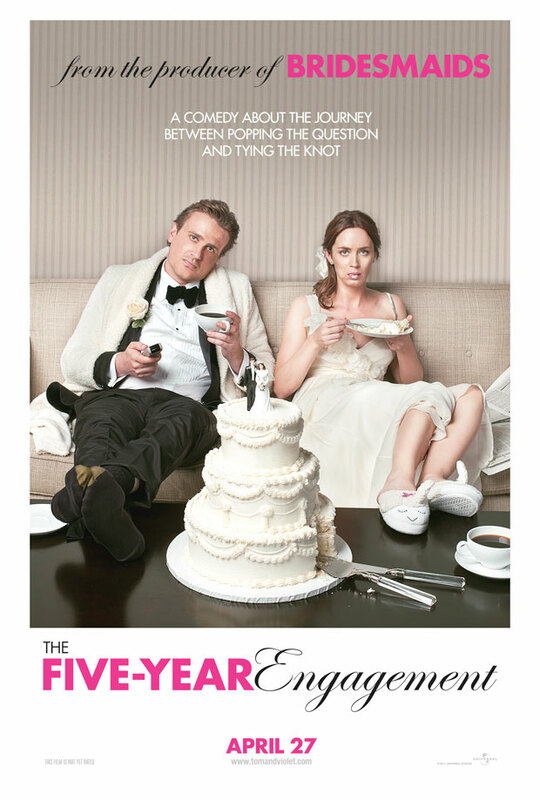 Nicholas Stoller’s The Five-Year Engagement, the latest raunchy-sweet rom-com to emerge from under the dependable umbrella of Judd Apatow’s production stable, truly tested my endurance for exaggerated romantic complications. Too bad, because this is frequently a really funny, smart and endearing effort that offers no shortage of laughs and a genuinely inspired, chemistry-laden pairing in Jason Segel and the perpetually ill-used Emily Blunt. They’re a charming duo, and we so badly want them to triumph that it becomes uncomfortable and frustrating to watch them run ragged through an endless and exhaustive gauntlet of stupid misunderstandings, weirdo behaviour and unnecessary plot contrivances. This movie badly needed to embrace a “less is more” philosophy. From the moment we bear witness to the meeting of chef Tom Solomon (Segel) and psychology PhD grad Violet Barnes (Blunt) at a New Years Eve superhero costume party (he’s in a giant pink bunny suit and she’s decked out in regal Princess Diana garb) we know these crazy kids are destined for holy matrimony. Of course, the real question isn’t so much “if?” as “when?” Following a proposal that’s both hilariously clunky and adorable (it’s centered on, of all things, business receipts), the lovers’ impending nuptials are continuously side-tracked by distractions; overwhelming wedding plans, the pregnancy and hasty marriage of Violet’s flighty sister (adorably manic Alison Brie) and – most importantly – promising career possibilities. After the bride-to-be is offered a two-year research position at the University of Michigan under a rock star professor (Rhys Ifans, unleashing his appealingly brainy eccentric oddness), the pair put wedded bliss on hiatus, vacate their sunny San Francisco digs and head east, beaming with optimism. However, shortly upon arrival, Violet thrives while Tom stagnates. Forced to take a go-nowhere gig at a local sandwich shop, and surrounded by emasculated men of limited vision, he begins to grow stir-crazy and resentful. As tensions increase between the two, and primo chef job postings filter down from back home, their once dreamy future grows murkier and murkier. Can love still conquer all? Similar to Stoller’s previous films, the side-splitting and truthful Forgetting Sarah Marshall (also, like this film, co-written by Segel) and the amusing, if uneven, Get Him to the Greek, The Five-Year Engagement is a shaggy, loosely-assembled series of comedic beats and situations stretched out over a lengthy run-time. They’re hang-out movies, allowing us to simply spend time with likeableably flawed characters and watch them joke around, talk and undergo personal change. For the first hour, his latest is a treat. Tom and Violet are interesting, attractive, multi-layered protagonists who feel like human beings, with all the foibles and intelligence one would hope to find in a prospective mate. And watching them navigate their way through the loopy demands of their crazy families and friends, and the simpler daily realities of Michigan life, leads to a number of inspired fish out of water scenarios (Tom’s inexperienced hunting trips and slacker workplace conjure serious laughs, as do Violet’s cuckoo-for-Cocoa-Puffs research team). As the quips and gags fly fast and furious – with an above average hit ratio – the film seems so confident that one could easily assume they’re witnessing a minor rom-com classic in the making. At least, that is, until the wheels fall off in the second hour. Perhaps concerned their story wasn’t substantial or outrageous enough, Segel and Stoller’s screenplay unconvincingly amps up the strangeness factor. Tom’s devolution into a bearded Ted Nugent-style outdoorsman – complete with a Texas Chainsaw Massacre-esque home full of products fashioned from animal parts – is abrupt and, frankly, kinda pointless. It drags the film down and exists solely to further distance the couple (not to mention set up a pretty lame crossbow gag). The same could be said for sequences depicting a messy encounter with a food fetishist or a pantless night time excursion through the frozen wilderness. Whereas Sarah Marshall’s bizarre flights of fancy occurred organically and were informed by the personalities of the characters, The Five-Year Engagement’s seem isolated and tonally awkward; like germs of dark comic ideas shoe-horned into a light-hearted comedy confection unable to support them. They disrupt the movie to a point where it never recovers, and act as a springboard to a truly draggy extended pre-wrap-up section that’s something of a chore to endure. Bridesmaids and Knocked Up earned their two-hour-plus lengths; this picture does not. As with past Apatow productions, the supporting cast is a brilliant who’s who of entertaining scene-stealers. 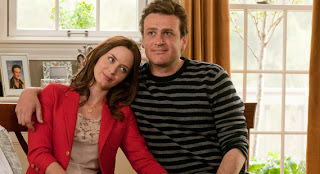 In addition to Ifans and Brie (who features wonderfully in a killer scene where serious personal problems are debated in Sesame Street impersonations), The Five-Year Engagement also includes memorably humorous turns from Mimi Kennedy, David Paymer, Mindy Kaling, Kevin Hart, Randall Park, Dakota Johnson, Brian Posehn and force-of-nature Animal Kingdom Oscar-nominee Jacki Weaver, as Violet’s pit-bullish mumsy. 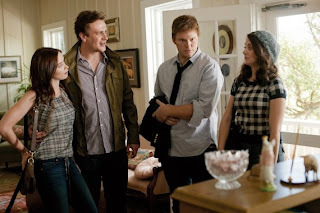 Playing Tom’s slovenly frat-jerk best friend, Parks and Recreation’s Chris Pratt is a hyper-energized portrait of id-driven cluelessness, while SNL regular Jim Piddock (last seen as 21 Jump Street’s doltish drama teacher), imbues his ineffectual, ghastly-sweater-knitting Michigan house-husband with a subdued streak of passive derangement. Honestly, there’s not a weak link to be found amongst any of the film’s amazing players. Segel and Blunt are delightful, and everyone else is on their A-game, delivering well beyond what the meandering script deserves. This is the most maddening type of noble failure; one with every element necessary for a home-run that can’t sort out its story from the suffocating muddle surrounding it. Just like Tom and Violet, The Five-Year Engagement has the best of intentions at heart when it sets out but, along the way, loses unfortunate sight of its much-desired objective.